Nepal is a landlocked Himalayan country bordered by China to the north and India to the south, east and west. It has an area of 1,47,181 sq.km which is only 0.3% of the total landmass of Asia and 0.03% of the world. Despite its vast resources, Nepal has remained a backward country for years. Among several causes, one is the country’s difficult physical structure. Nepal, though small, is one of the few countries of the world with most varied land topography. Based on its landform and climate, Nepal is divided into three regions: the Himalayan Region, the Hilly Region and the Terai Region. These are distinct ecological regions running west-east horizontally. The high mountains in the north, the moderate Mahabharat hills in the centre and undulating chure hills with their sheltered lowland in the south are the predominant landscapes of the country. As we know government alone cannot take care of the whole country, so to carry out uniform development to increase people's participation, to use resources, to decentralize the power our country is divided into 5 development regions, 14 zones and 75 districts. Such regions are known as Administrative Regions. Each district is headed by a chief district officer (CDO) and is responsible for maintaining law and order and coordinating the work of field agencies of the various government ministries. Nepal is a landlocked Himalayan country bordered by China to the north and India to the south, east and west. Nepal has an area of 1,47,181 sq.km which is only 0.3% of the total landmass of Asia and 0.03% of the world. 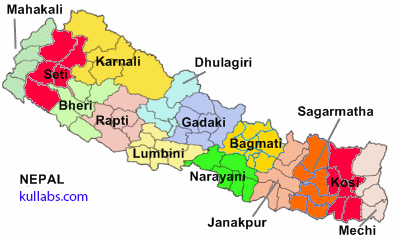 Nepal is divided into 5 development regions, 14 zones and 75 districts. Nepal, though small, is one of the country of the world with most varied land topography. Why is Nepal divided into districts? For the proportional representation of different people of different regions in the government. Explain about the physical aspect of Nepal. Nepal is a landlocked Himalayan country bordered by China in the north and India to the south, east and west. It has an area of 1,47,181 sq.km which is only 0.3% of the total landmass of Asia and 0.03% of the world. Despite its vast resources, Nepal has remained a backward country for years. Among several causes, one is the country’s difficult physical structure. Nepal, though small, is one of the few countries of the world with most varied land topography. Based on its landform and climate, Nepal is divided into three regions: the Himalayan Region, the Hilly Region and the Terai Region. These are distinct ecological regions running west-east horizontally. The high mountains in the north, the moderate Mahabharat hills in the centre and undulating Cure hills with their sheltered lowland in the south are the predominant landscapes of the country. Name the districts that touch the border of China. List out the districts that touch the border of India. What is the area of Nepal? How many districts are there in Central Development Region? In which development region does Narayani lie? What percent of the total landmass of the world has Nepal covered? Any Questions on 'Zones and Districts of Nepal '?